Do you ever wonder whether or not you should use protein shakes? I recommend protein shakes often for specific reasons. I’m not always sure that people actually know if they need them. I think there are a good number of folks that think if they exercise they need them. Let’s find out if they really do. I partnered with Burt’s Bees to bring you this post. I received samples and compensation for my time. All opinions are my own. Protein is a macronutrient just like carbohydrates. Macronutrients are used as an energy source for our bodies. This means that protein provides calories. An energy source though is not proteins main job in our bodies. Our bodies are made of protein. At the very core, protein is part of our DNA. Our muscles and skin are made of protein. We have protein in our blood. Hormones are proteins. So you can see that we need protein for many different reasons other than energy. Proteins are made up of small components called amino acids. Our bodies do not produce 9 of the amino acids required by our bodies. These amino acids are called essential because it is essential that we get these from our food. Animal proteins are called complete proteins. Most plants, except soy, are incomplete proteins. Incomplete proteins are missing 1 or more essential amino acid. The Recommended Daily Allowance (RDA) for protein is based on body weight: 0.8 grams of Protein per each Kilogram of weight. For example, a 150-pound person would need about 54 grams of protein each day. If a nutrient, such as protein, has an RDA this means that there is enough research to say that this is the amount sufficient for the majority of healthy people. There are of course instances when some people need more or less than the RDA. For example, people with Kidney disease who are not yet on dialysis and are trying to slow their disease are advised to eat less than the RDA. There are of course plenty of people who need to eat more than the RDA. For example, dialysis patient and those recovering from certain illnesses may need more protein. Healthy people may also need additional protein, such as pregnant women, lactating women, and athletes. Of course, like most dietitians, I recommend first that my clients eat more food that contains protein. This isn’t always that easy. For this reason, I do recommend protein powders and other supplements pretty often. For whatever reason (and there can be many) you just cannot reach the recommended protein level. Maybe this is related to your food preferences, food intolerances, schedule, or budget. Many of my clients have carb-heavy breakfasts. Cereal, bagel, muffins, and toast are common breakfast choices. These choices are not rich sources of protein. Eating balanced meals is important to not only meet your energy and nutrient need but to aid in satiety. That mid- morning energy slump you feel will go away if your breakfast has not only carbs but protein and fat too. The idea that the more protein you eat, the more muscle you will gain isn’t necessarily 100% true. To gain muscle strength and mass we first need to do the work (exercise). We need energy in the form of carbs to do the work and then protein to help repair and recover after the work. This repair and recovery will help build muscle. Athletes and higher intensity exercisers do have a need for extra protein. This is not an excessive need, though. For example, the RDA for a marathon runner is 1.2-2 grams per kilogram of body weight. An individual may not be able to consume this amount of protein from food alone. 4.You have a medical condition that requires you to consume sufficient or additional protein. Weight Loss Surgery Patients require additional protein to prevent muscle loss during rapid weight loss. Vegan and vegetarian diets are generally a healthy way of eating. There is a concern at times that people following plants based diets may not consume enough protein or consume all the essential amino acids. This really is not an issue as long as the diet is varied and contains rich, plant-based source of protein. I have had many clients who wanted to follow a plant based diet but were very picky eaters and didn’t like most rich sources of plant based protein. One in a particular was also going through weight loss surgery. My client needed additional protein after surgery, but she didn’t like most plant-based proteins. A plant-based protein shake was important for her recovery. 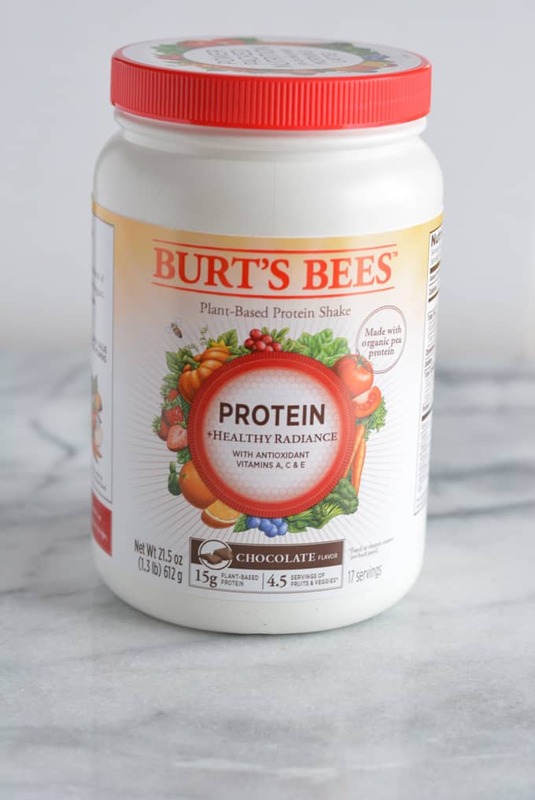 Burt’s Bees™ has introduced a plant-based protein shake, Protein +Healthy Radiance that contains 15 grams of plant-based protein. 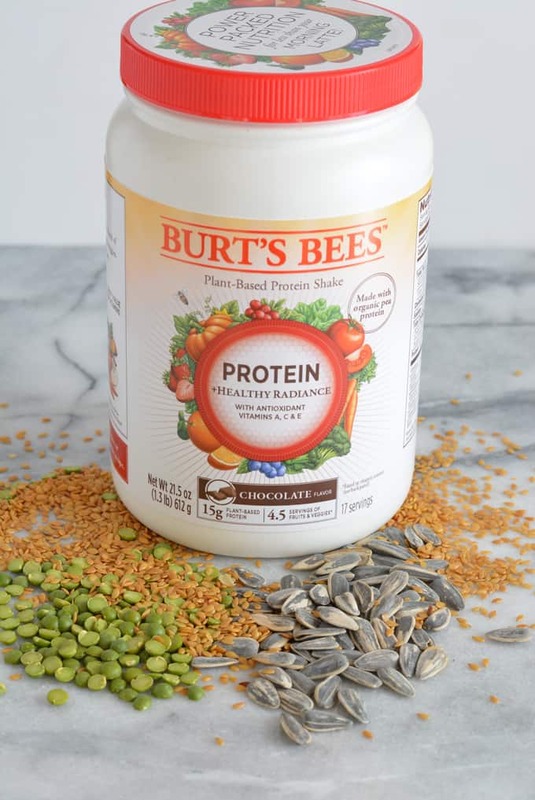 Burt’s Bees™ Protein Shakes are made with a blend of pea, brown rice, sunflower seed, oat and flaxseed proteins. 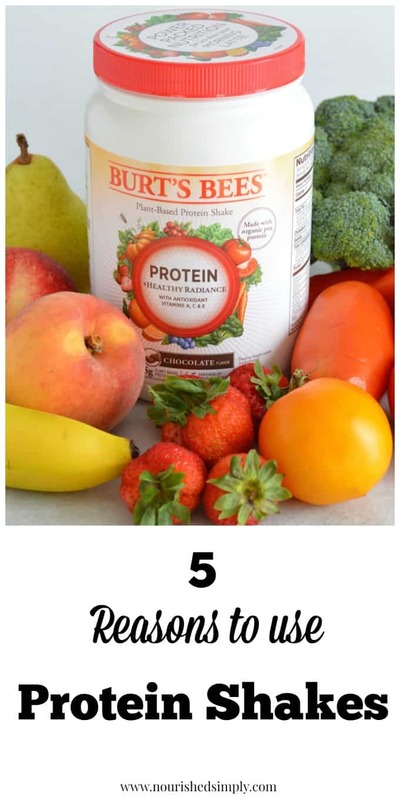 Their shakes contain all the essential amino acids to make this a complete protein source. 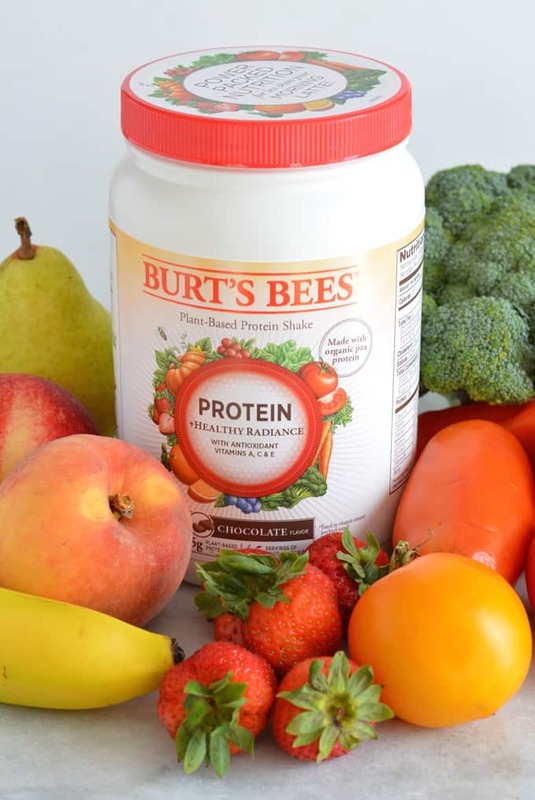 Burt’s Bees™Protein Shakes are a good source of vitamins derived from plant sources, not additives. All shakes are gluten-free, dairy-free, and soy-free. Ingredients are non-GMO and contain 70% organic ingredients. Sweeteners used are honey, organic Stevia leaf extract, and monk fruit extract. Flavors include vanilla and chocolate. So, do you think you need a bit more protein? 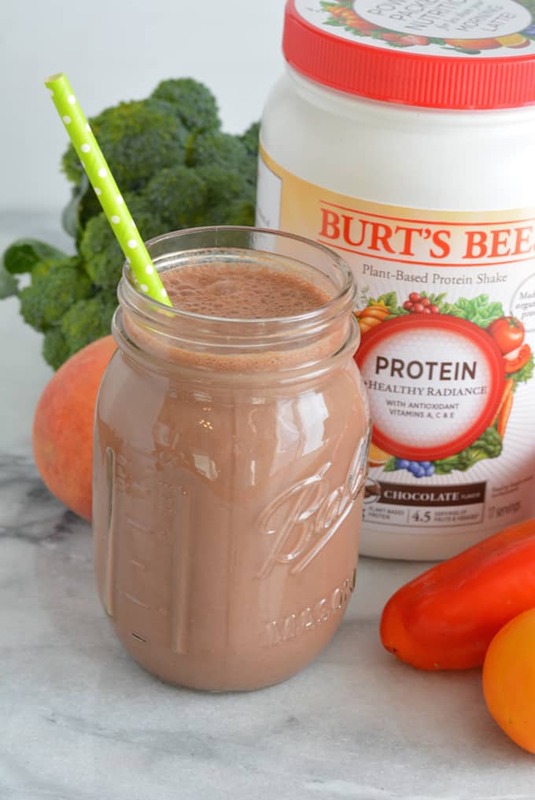 Burt’s Bees™ Protein+Healthy Radiance Protein Shake can help you meet your protein needs whether as a breakfast drink, mid-afternoon snack, or workout recovery shake. Great info here! 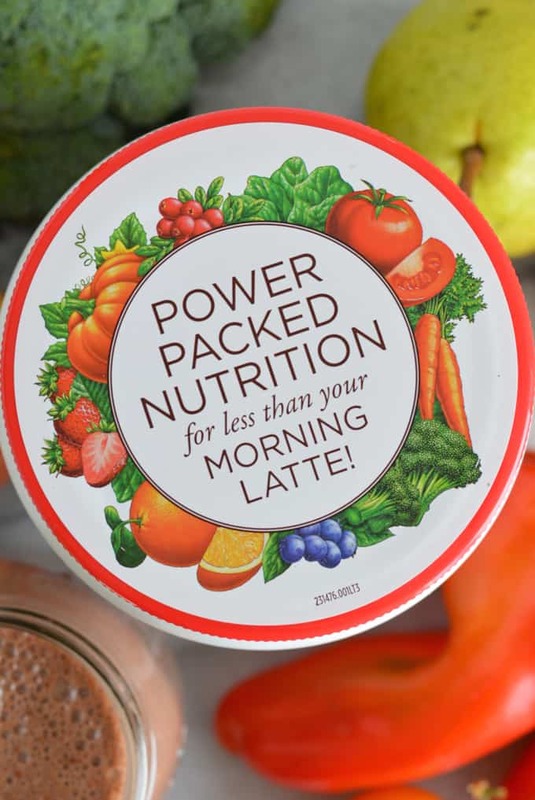 Always keeping my eyes open for a good protein powder – will have to check this one out.